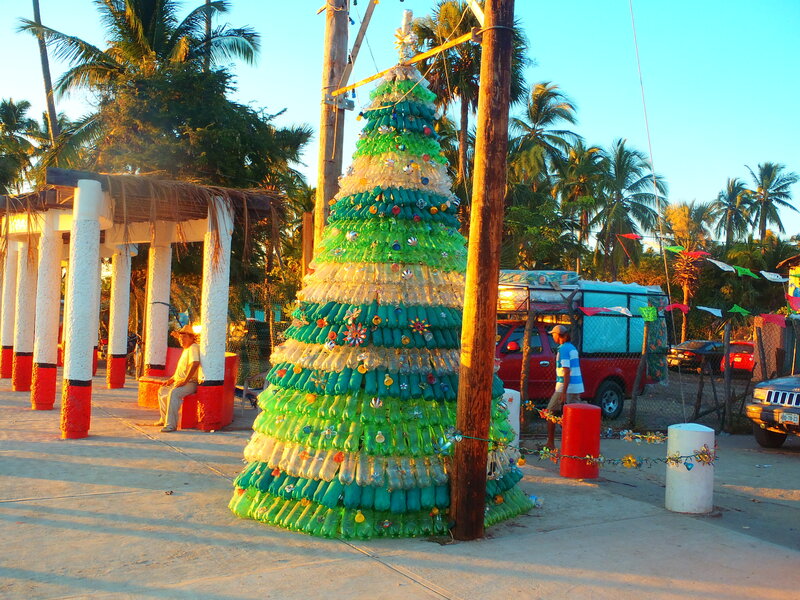 Christmas tree made of recycled 2 litro bottles! Very sustainable choice of decoration! The last couple weeks we have been grinding on the bikes as we made goals of place to be for the holidays. 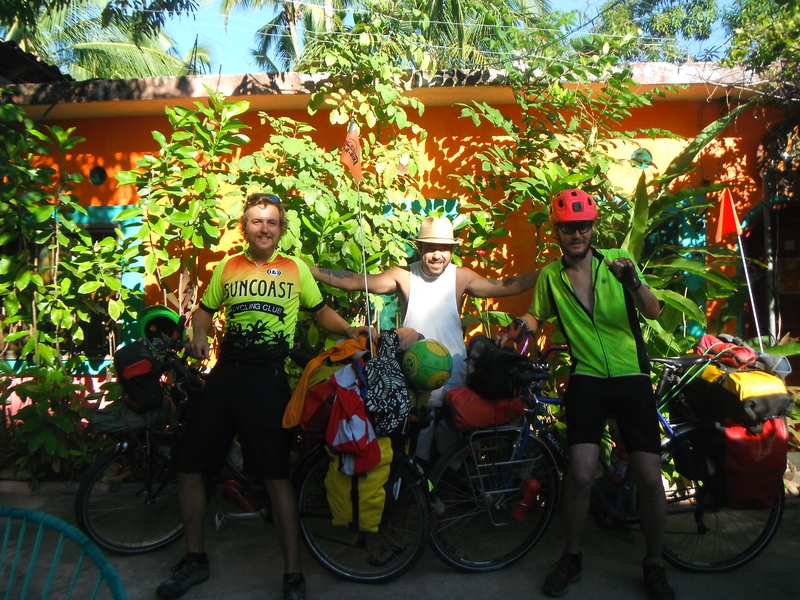 After staying in Barre Navedad Hen and Ike biked to a small surfing village called Pascuales, where we met up with Tommy and Bradie who had been hanging around for a day and a half before the others arrived. We ended up staying at Al’s cabana where we got to chill with some locals and watch the epic double overhead tubular waves crush surfers from around the world. While we were there we saw 2 boards break in half and a handful of wipeouts. 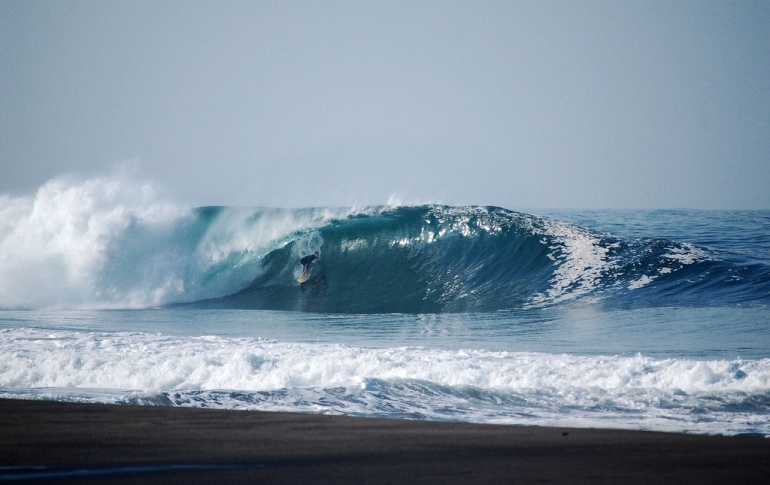 Al’s son, Alanito, is the best youth surfer in Mexico and being 11 years of age was already doing photo shoots with a local coconut juice company and a couple of good lookin chicas! 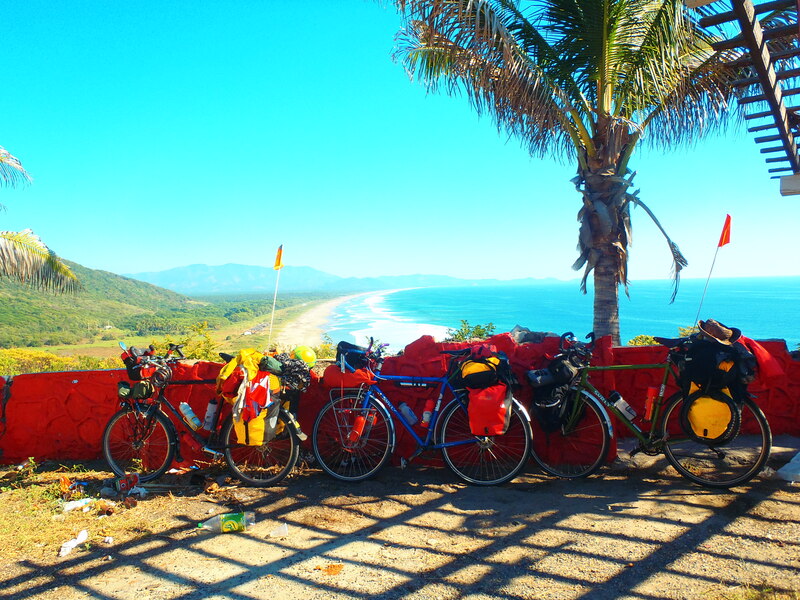 After hangin hard there for a nice rest day we decided to roll south down the state of Michoacan, which ended up being some of the most epic climbs and amazing beaches. The first night in the Michoacan we stayed next to a banana farm that was on one of the many rivers in the state. We got rained on for the first time in 50 days of travel!! 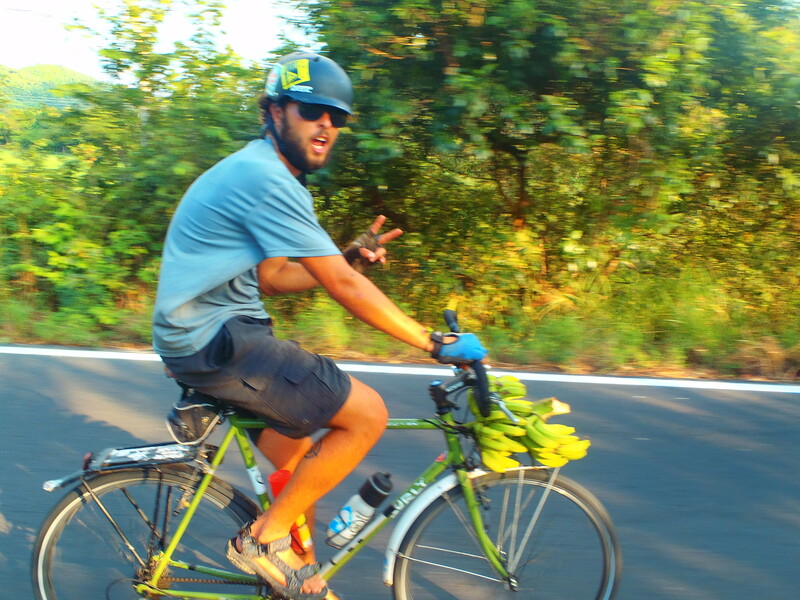 After a hot, humid, buggy night we woke up to a banana farmer giving us a bonanaza of bananas and were on our way. Climbing the steep jungle mountains on the coast was difficult but very rewarding as every summit there was an amazing view of the rocky coast. 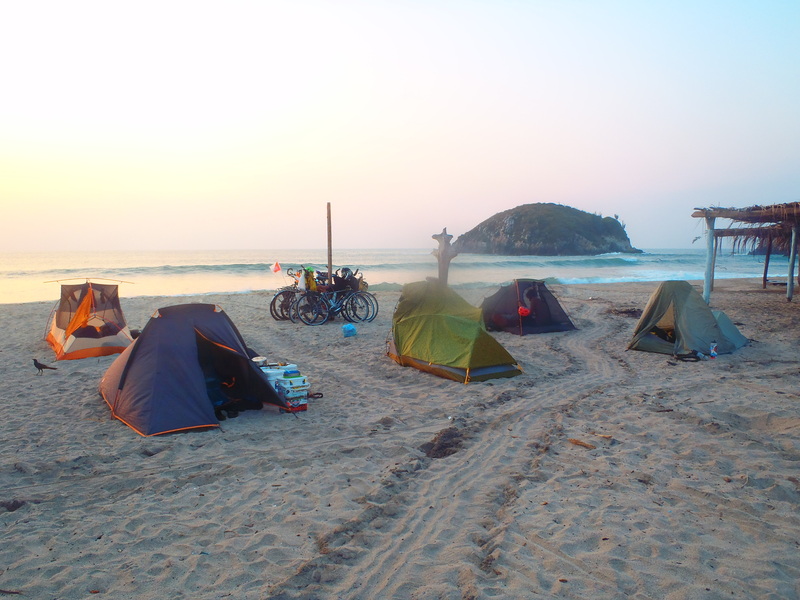 Camped in Muarata, the tracks were made by sea turtles during the night! We got to a small village and as we pedaled in our meditative ways, ran into an australian couple that were also on bike tour! Pepe and Bren had started in Canada headind down the western USA and enjoyed cycle travel so much they dipped down in to Mexico where life is tranquillo. 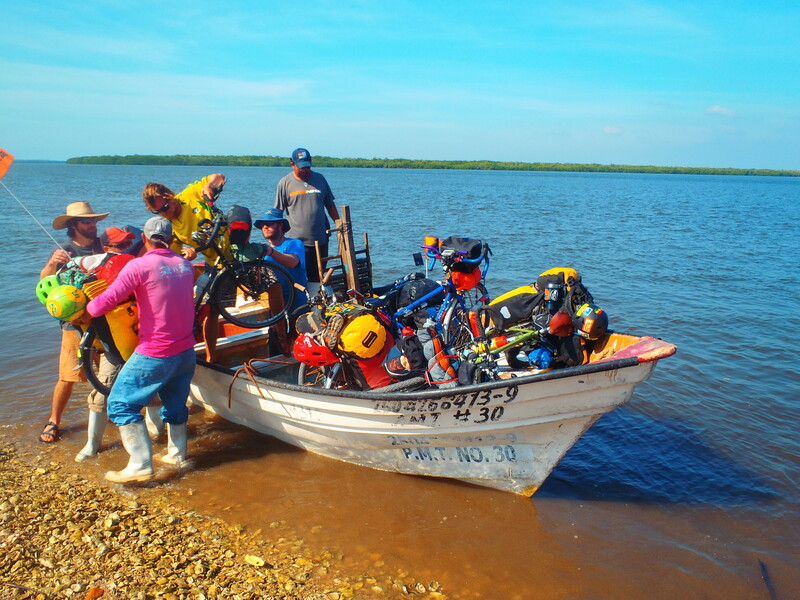 We pedaled with the aussie team till we got to Maruata, a nice white sandy beach with an abundance of fishing boats and a turtle rescue camp located on the outskirts. Later that night we noticed a copious amount of oval shapes scattered across the humanless beach. We cruzed down to the turtle camp and met Socrates who was in charge of the turtle refuge. He told us that the turtles were becoming endangered due to the aves (birds), cangrejos (crabs), perros (dogs), as well as la gente (people). Unearthing the eggs from the sand is illegal to do, yet many people still do it as restaurants pay a lot of money to buy the eggs as they are seen as a luxurious meal to many. At the turtle camp the volunteers unbury the eggs and bring them to a spot that is surrounded by a fence. 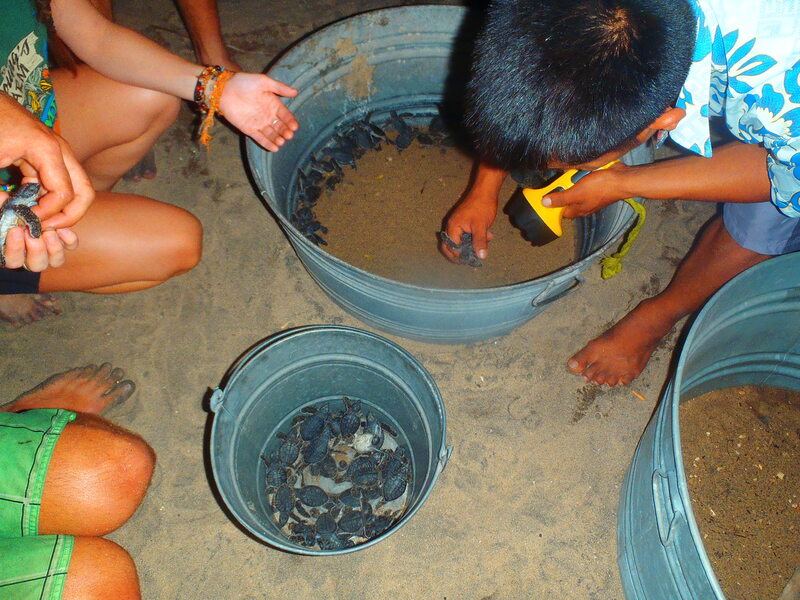 It was here that we were able to watch the baby turtles break out of their shells and climb to the real world! After this we had to collect them and released about 70 of them into the ocean in the pitch dark so it was harder for predators to attack. Muarata was way chill! The aussies pedaled off before us but we were gonna meet them up later in the day. Michaocan coast is unbelievable. Seaside cliffs with uninhabited white sand beaches greet the rider at every turn. Massive uphills lead to wicked downhills as the theme of the day was climb, get treated to a bitchin view, then balls to the wall downhilling brakes out 60+! We passed the Aussies as they were having bike troubles. After we took a nice lunch break they caught up with us. We gave them some coconuts we had been gifted by some locals for a refreshment! 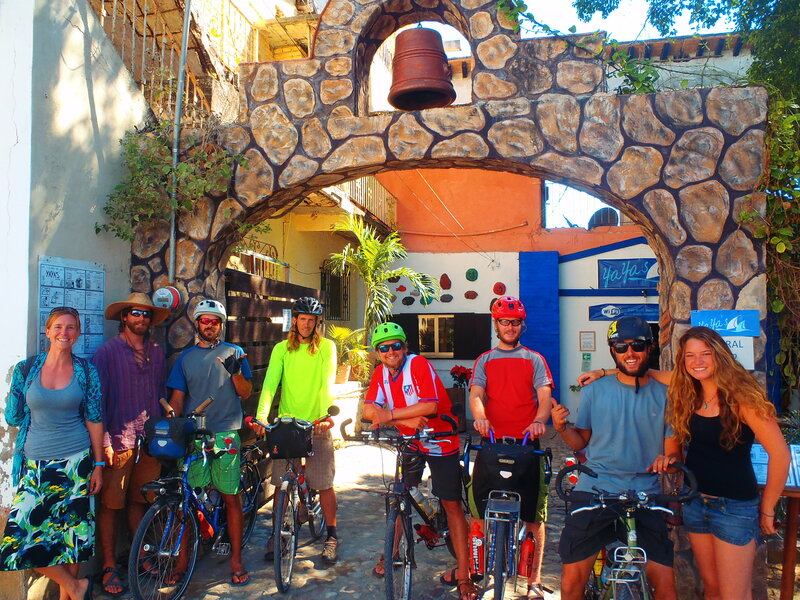 Our team pedaled off ahead of them with the goal of another 40km in the afternoon to the beach town of Neixpa! We were groovin hard, climbing and descending the coastal road when we decided to take a break and rest. Snacking on some peanut butter we saw a big green schoolbus ride by honking and waving at us! On the side it said “DOWN TO EARTH.” For some reason we knew we had to get on that bus!! We pedaled down the hill after the bus and sure enough it was pulled over waiting for us. Our Aussie friends had gifted the bus owners some water after lunch and the bus drivers Ike and Lora had offered them a ride! Pepe and Bren had hitchhiked all over the USA last year and they said the hitchhiker in them knew that they had to get on the bus. Bikes and all. 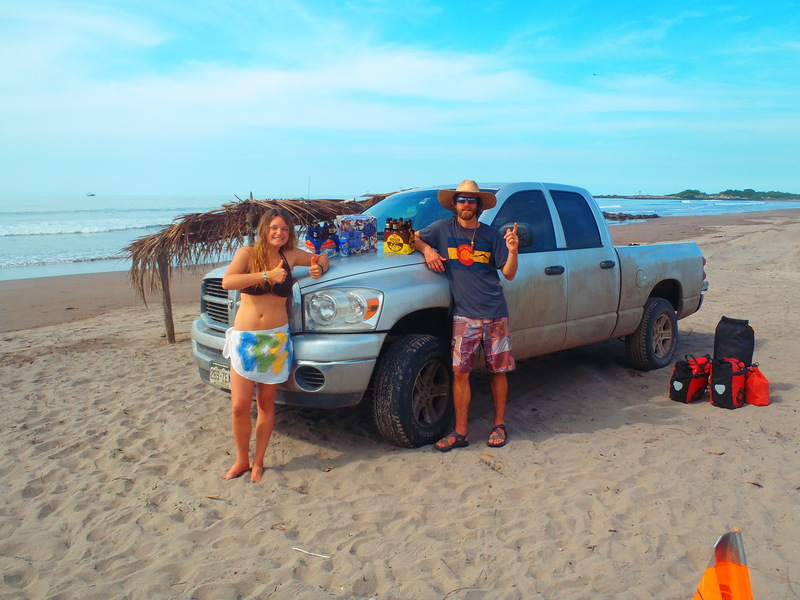 The Aussies told Ike and Lora, that B-Koz needed a ride to Oaxaca to meet up with his girl friend for Christmas. We all ended up jumping on the bus which was awesome! 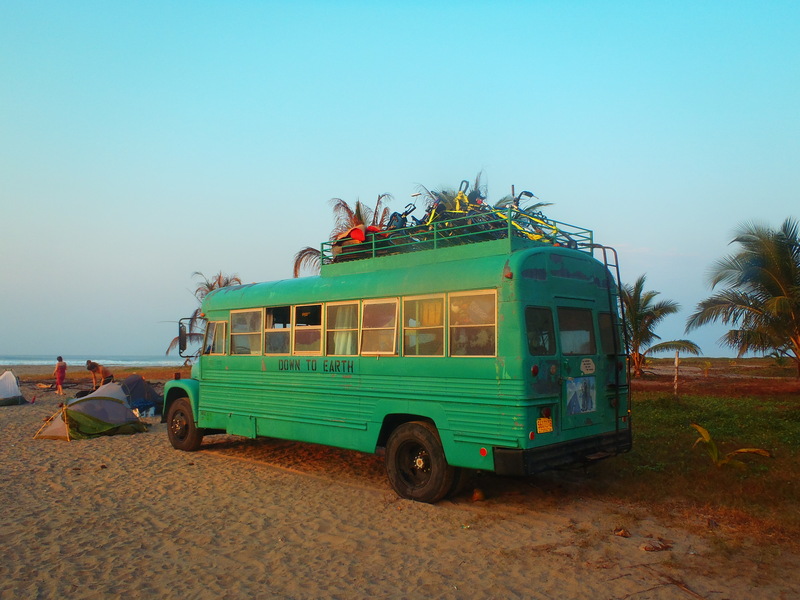 Ike and Lora are two hippies from New Mexico who live in the Down to Earth Bus. They figured it was cheaper to drive to Belize for winter than to pay to heat the bus in New Mexico! Radical! The Earth bus has been converted for living on, with oven, bed, fridge, etc. We piled all our bikes on top and got on the bus! What a riot! Ike the driver said the bus goes slow but to us cyclists the bus was speeding through the Mexican countryside! There’s no such thing as open container laws in Mexico so it was awesome to be drinkin beers cruisin the highway on the Down to Earth Bus!! We camped at Playa Azul near a lagoon and saw some Caiman! Caiman are crocodiles that live in brackish water. The next day we rode the bus to Zihautenajo where Hen and Tommy got off to dig the city while Ike and the Aussies got off 10 km down the road to go check out this small beach village! B-Koz stayed on the bus and rode to Oaxaca to dig his girlfriend. We’ll catch up with B-Koz in a few weeks time, surely he’ll have some adventures to share! Zihau was rad for Hen and Tommy. We rolled into town and sought out the local hostel. Rincon de Viajero. 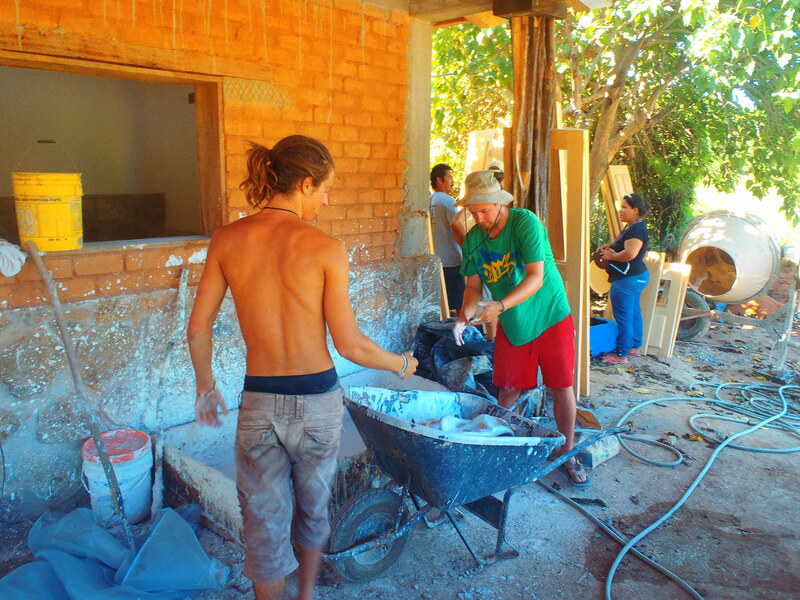 The hostel is owned by local surfer and artist Mallinalli. She is a super chill lady. After walking around the town it was nice to get out of the sand, relax, and sleep in a bed. We picked up supplies from the local bike shop which included tubes, and some new cable housings. Chillin at the hostel, hanging with Mali and Esteban. Esteban is from Argentina, and a diehard Boca Juniors fan! He was mad psyched that Hen was heading to Brasil for Copa Mundial and ended up gifting him an AS Roma jersey for his travels! Thanks Esteban!!! We met back up with the original Ike and the Aussies down the road the next day. They ended up staying under an outdoor restaurants ramada and got to help fish with a local family on the beach at night. They caught a puffer fish and a baby shark , which were not edible so Ike quickly threw them back into the sea before the puffer puffed up to his maximum capacity. 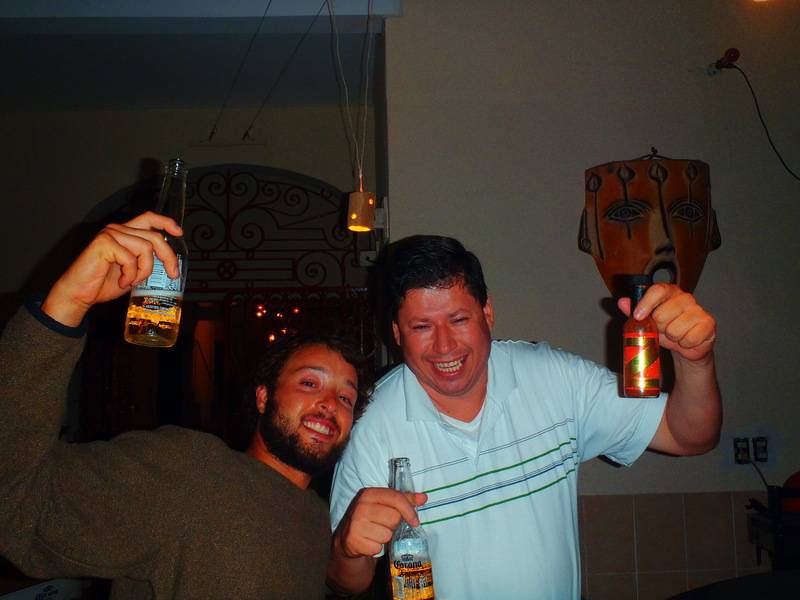 The Aussies are hanging at Barra Potosi for Christmas whereas the American Team headed south towards Acapulco! 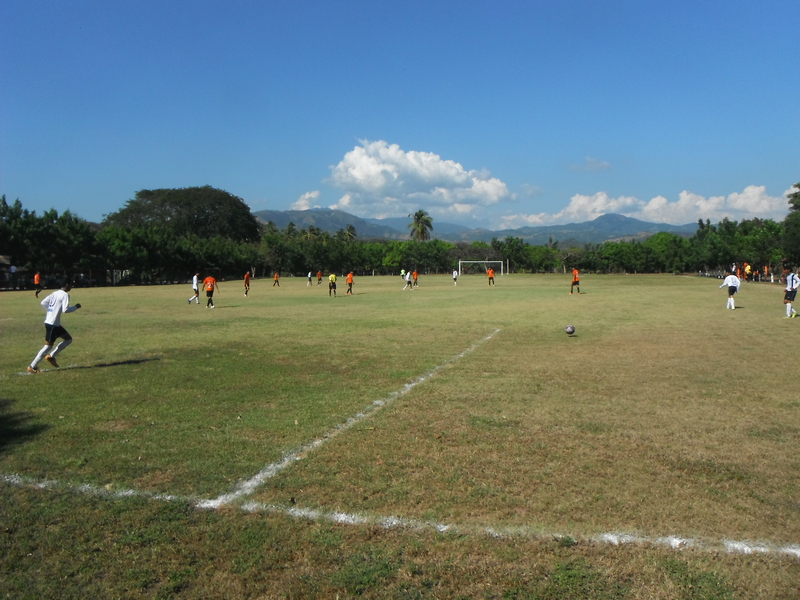 Searching for a place to chill for lunch we rolled past a footy pitch where they were hosting the Rodesia Cup 2013. We stopped and watched a 3rd divsion Mexican football match between Tecpan and Acapulco. Tecpan ended up winning 3-0. 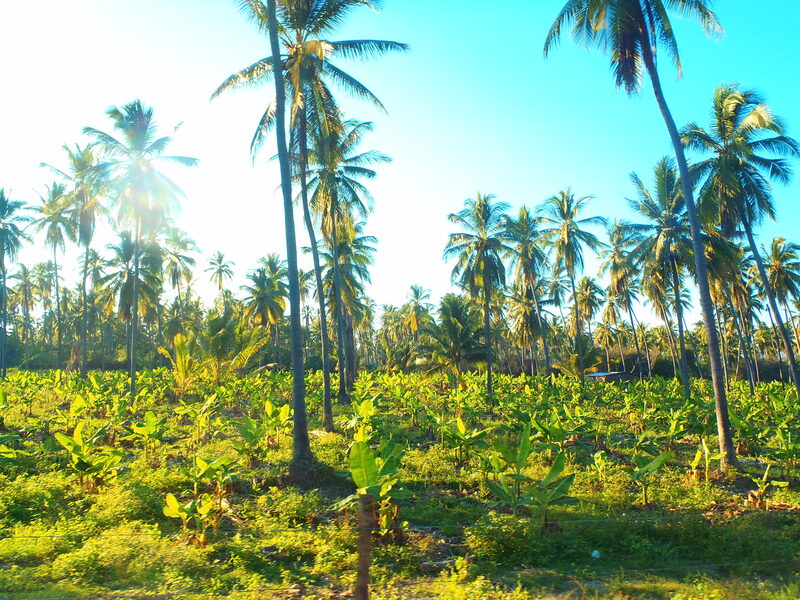 After watching the footy match we found ourselves in a forest of coconut palms with banana palms planted underneath. These two palms are classic companion plants as the coconut palms grow much taller then the bananas and the banana palms don’t mind being a bit shaded by the cocos. Makes for a nice coco-nanner smoothie too! 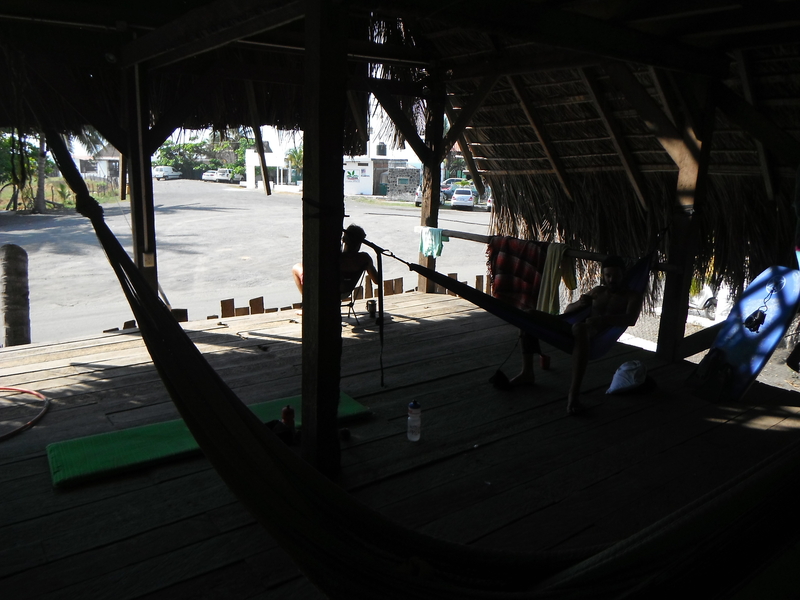 One night during voyage towards Acapulco we were searching for the beach to camp on when the road ended at a dock. Across the river was the sand bar where the beach lay. It cost us 30 pesos to cross the river via water taxi where we were astounded to see hundreds of tents set up. Lots of Mexican hippies, gypsies, and dreadies hanging on the beach for the weekend. As it turned out it was Friday and there was a huge dubstep/reggae party on the beach that evening. Excellent, when in Mexico do as the Mexicans do… We had a great evening chillin on the playa jammin out to tunes and cruisin the beach. Lots of hippies camping on the beach! Reggae Dub party in the evening! Rollin into Acapulco we met up with a fellow cyclist Carlos, out on his morning ride! He escorted us into Acapulco and took us to the cliff jumps that we had heard about. Ike and Hen were more than psyched to jump the 35meter world famous cliffs. We explained to the head of the Clavadistas (Cliff diver) that we were experienced clavadistas ourselves and we had traveled here to jump. They said we needed to do paperwork and get permission from the office which was closed because it was Sunday. The thought banditing the jump crossed our mind but the cliffs are only accessible for jumpers through a building. And they were onto us already with multiple policia around looking for something to do. We didn’t want to attract any trouble to ourselves so we rolled through Acapulco! 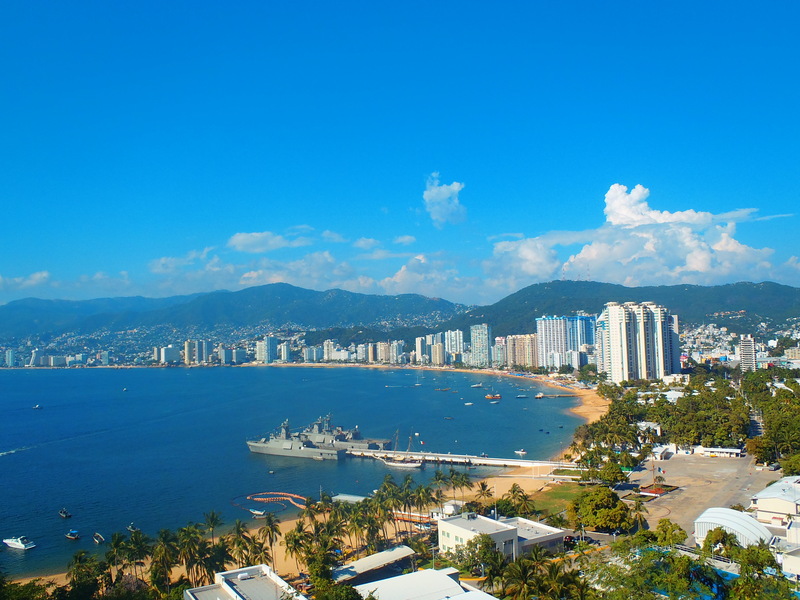 Acapulco was pretty cool experience. Its reputation has been tarnished due to the ongoing drug war but we enjoyed biking through the city and its unique bay. A 4 km climb out of the city led us to a crazy downhill in traffic towards Barra Vieja. Searching for a place to spend the evening we asked a beachside restaurant if we could camp there. They offered us there open air loft accessed by ladder above the kitchen to spend the night. Perfect. That evening chillin on the beach we saw a girl with a pet lion! Crazy! The night watchman Martin had a German shepherd “Perro Bravo” (Guard Dog) to watch over the restaurant. Hen descended the ladder to grab a coconut off a tree and the dog went after him only as far as its chain would allow. Whew, good thing Martin knew we were the good guys! Feeling secure we passed the night in the loft. The view from the loft! 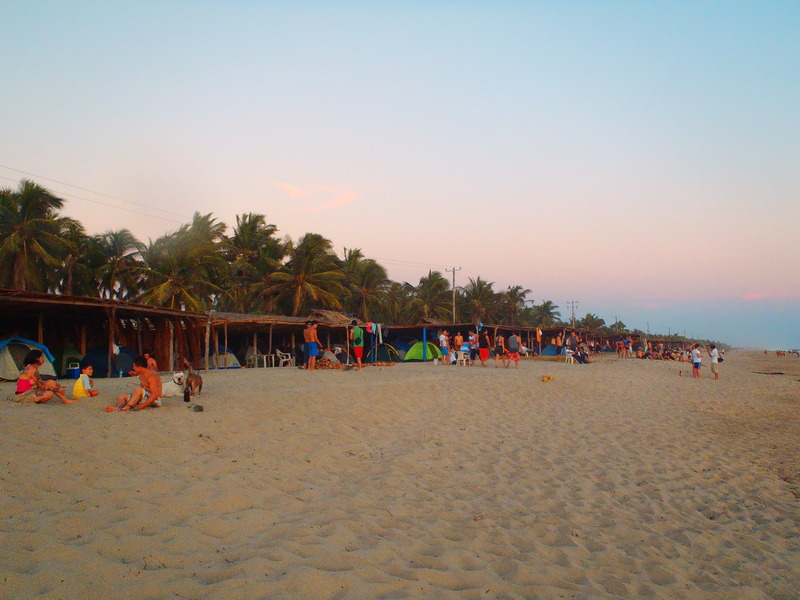 Mañana we made the 130km push to Playa Ventura where we spent Christmas! It was different to be away from home for Christmas but it was great experience! Tommy made his famous Green Chili for dinner and we realized that we have everything we need right here with us on our bikes! 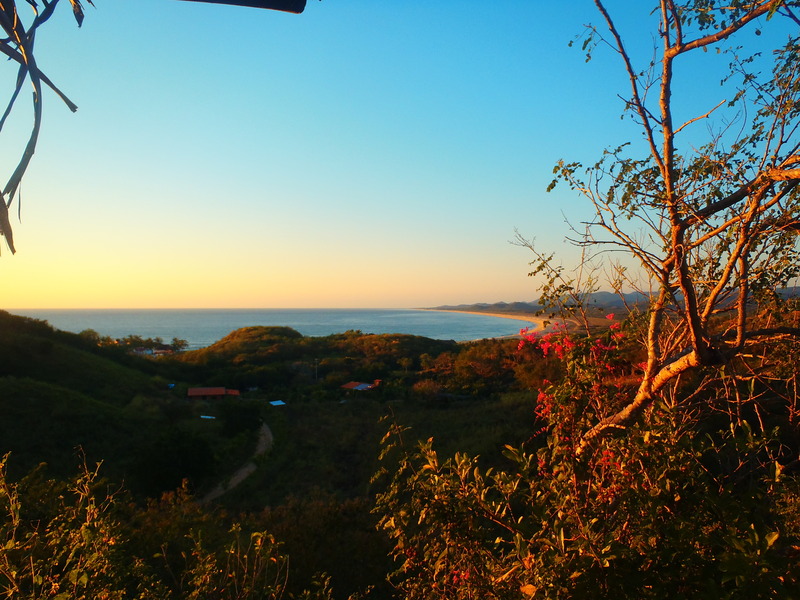 We are camped at Finca de las Palapas, a hospedaje that rents rooms. We are camping in the back yard enjoying the outdoor kitchen and hangin with the kids! 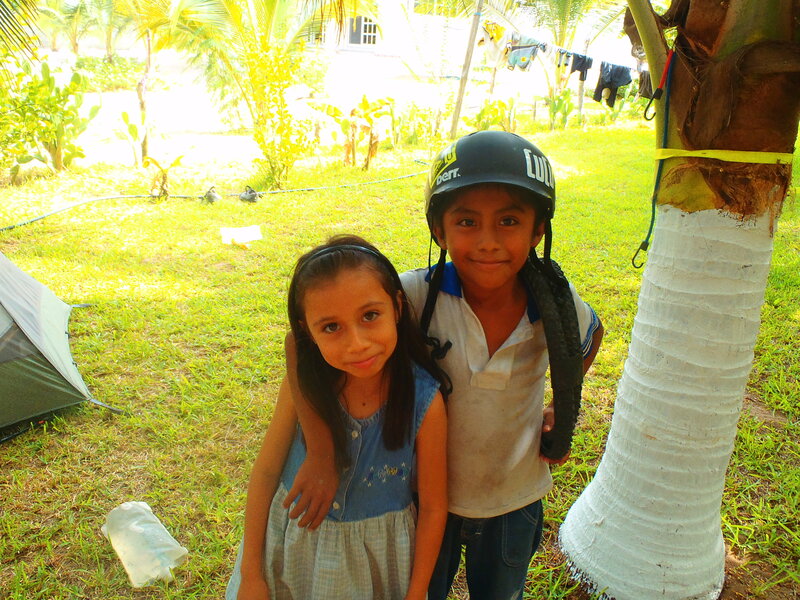 Jasmin and Irwin, our new friends! 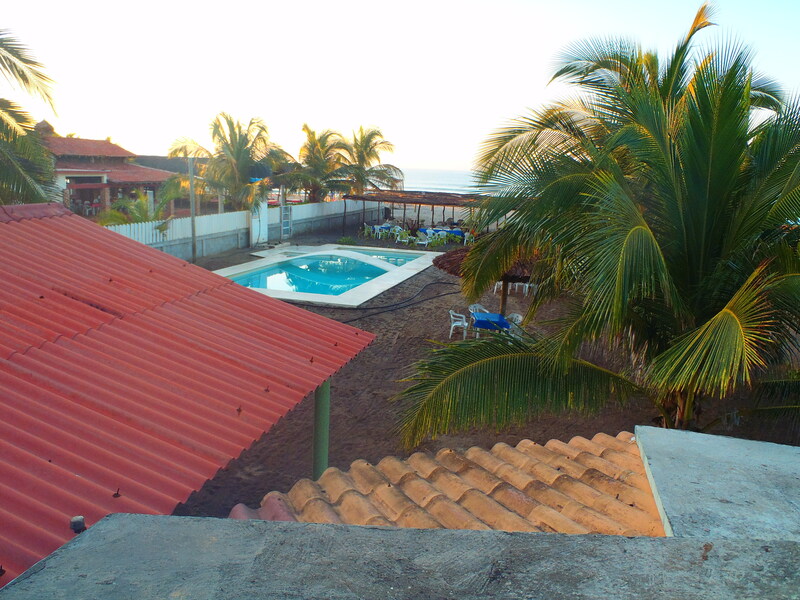 After Christmas relaxation we plan on heading to Puerto Escondito for the New Years! It will be nice to relax and party with fellow international travelers! We have about 300+ km to Escondito stay tuned! Whether naughty or nice, dont think twice… Ride your bike! Hey friends! It has been a while since we have been able to sit down and describe our findings on the latest sustainably south activities, but everything has been great! We left off a while back when we were still in Baja. Since then we have taken a ferry to the mainland and have been liven the mainland, jungle lifestyle. We were lucky enough to have our friends Wes and Michele drive down and meet up with us in Teacapan, which is a super cool little fishing village that our friend Jonny had recommended we go. Wes and Michele brought us many supplies as well as things that we take advantage of in the states such as gatorade, snickers bars and of course Colorado beer! Wes and Michele with support vehicle and Colorado beer! We met a nice couple from Canada, Kurt and Erica, who invited us to stay in the backyard of their amazing house that looks out over the ocean. It was here that Kurt let us use his sea kayak as well as his trimaran one person sail boat! For trade we helped him build up the sea walls on his beach. For those of you that don’t know, a sea wall is built on beaches where the ocean has eroded the beach away and is starting to erode the structures that have been built further inland. Took a boat south to cross a river that would have taken an extra day on bikes! After our stop in Teacapan we cruzed through the mountainous jungle terrain to San Blas. We stayed at a surf camp on the beach and had a whole cabana for the 6 of us! Besides the intense bug biting, we had a good time hangin and surfing on the beach. San Blas was indeed a blast but had places to be and our other friend Wes (who we met on the ferry) to see! Made it to the sailing town of La Cruz with support team and all. 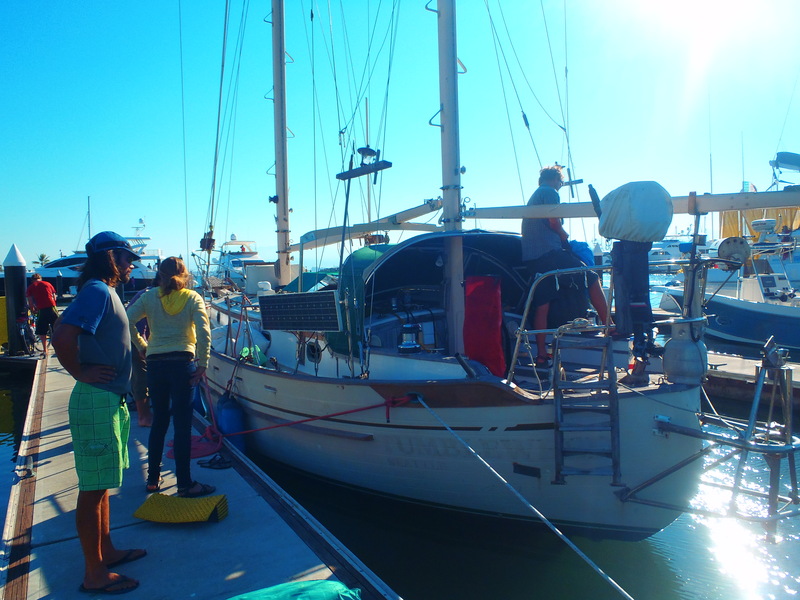 Camped out on Wes’ sail boat and left for Rancho Sol y Mar. This was a super sustainable farm that is owned and operated by a couple from the states, Dan and Holly. They have the first edible campground around and the first campground that is completely run off of solar power. The grey water is reused from the showers and sinks for the banana and mango trees. The black water from the toilets is also filters to their trees through a 3 filter system as well. 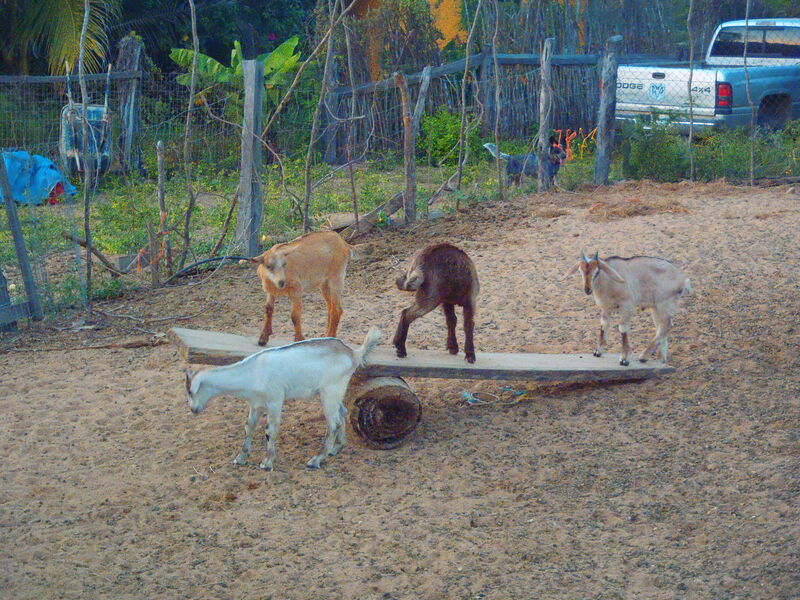 Goats and chickens roam freely and are used for the eggs and also make goat cheese out of the milk. We got to try the ricotta cheese, nothin like fresh goat cheeeeeeeese! On sunday Hen and Ike went to the local football match where all the local villages teams, friends, and families come together to play soccer. It was a big party with 8 villages teams showing up playing hour long matches with the winner staying on. People drinking beer in the back of pickup trucks cheering and shouting. Ike and Henry played for Villa del Mar a local village from down the coast. We ended up losing 2-0 to the Red team. but it was extremely fun to get to kick it with the locals. They gave us beers after the match and everyone was psyched that we gringos were down to play football. Hen and Ike wanted to explore the ranch more so we decided to split from the Ranger crew (Tommy and B Koz) and meet up in a few days. Its nice being able to be flexible and break into teams sometimes if it calls for it. Living at the ranch 4 nights, we agreed to work a few days for our stay. 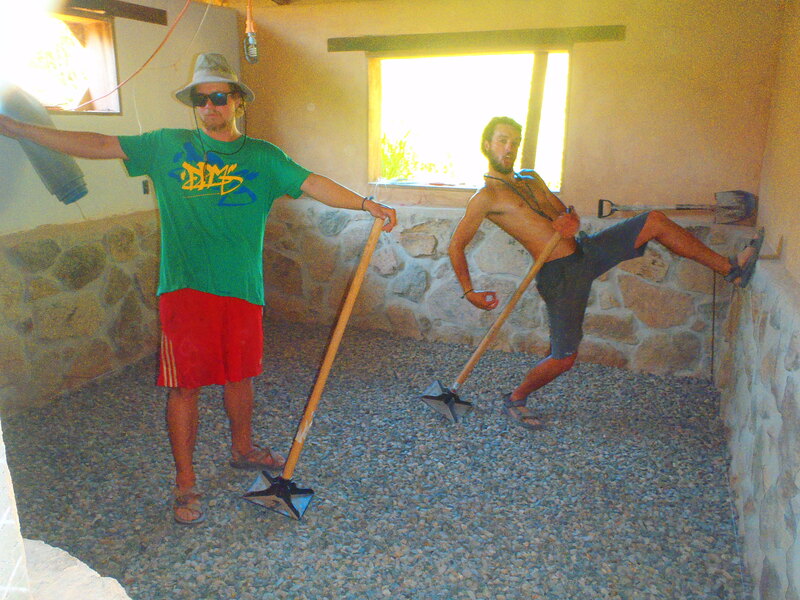 Luckily for us they were building a new guest house built with compressed earth blocks, and a cob floor. Each block is made with a special blend of clay and sand that creates a hard concrete like block. In between these stacked blocks is another mixture that keeps the blocks in position which is made with lime, clay and the napol cactus which is a local cactus and has glue like properties. The house was basically up so we were on the floor crew. Learning how to make soap with new Swiss cyclist amigo Joan. Dangerous stuff!! Packing gravel and dirt to create a smooth flat surface for the final cob layer. The cob is made with clay, sand and straw that also makes a strong surface. Using the clay and the straw makes it so the house remains cool during the hot days and keeps ventilation possible through the entire house. 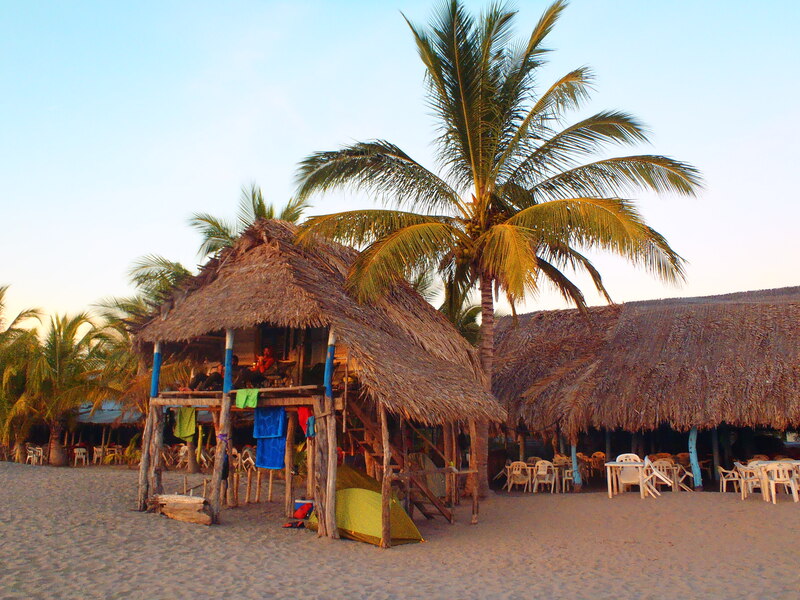 We headed south on some gravel roads towards Manzanillo and are currently in the tranquillo village by the coast of Barra de Navidad camping out in Piper’s bar. Hope all is well back home and everywhere else! Keep your chain free of rust, and your choniez dry! Highlights from the 2nd leg of the voyage. Baja California Sur! 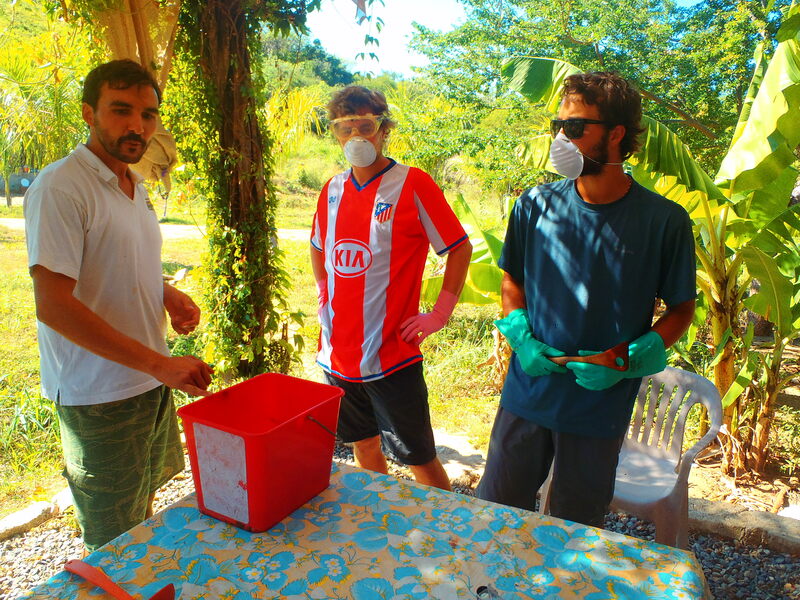 Outrageous fun at the salt mines, mulege, and bahia concepcion!